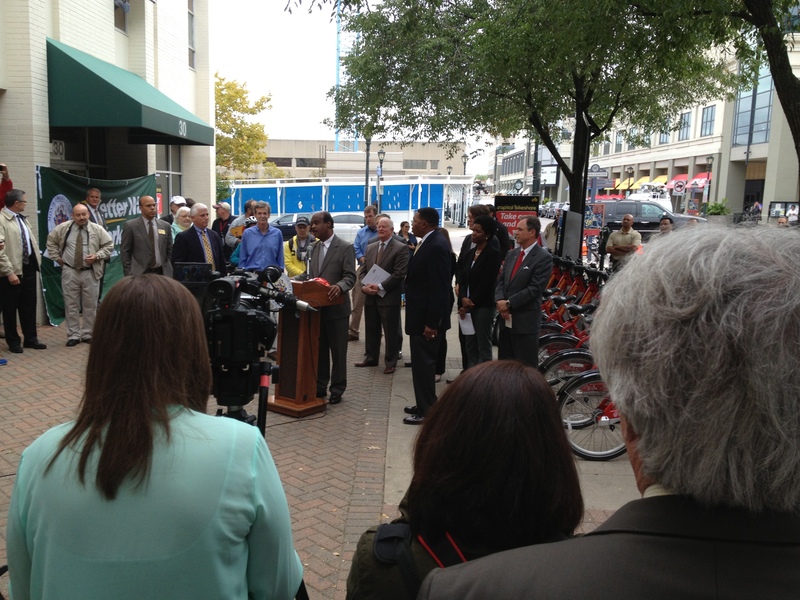 A crowd gathers in downtown Rockville for the launch of Capital Bikeshare. 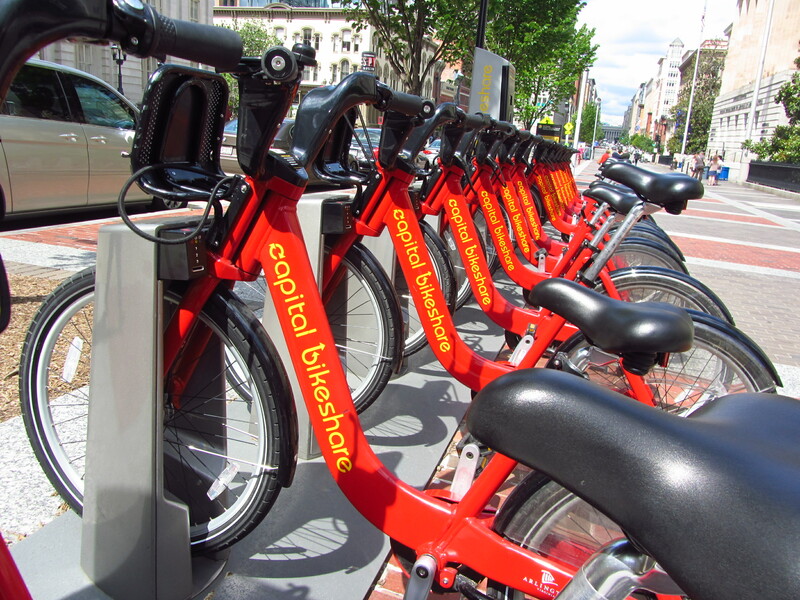 Capital Bikeshare, the popular bike rental program in DC, has jumped the Beltway and into downtown Rockville. This morning a crowd gathered near the Red Brick Courthouse to witness the launch of this fun and healthy program in our hometown. Although the program doesn’t provide the transportation connections I had hoped for (there’s nothing in the south end of Rockville for the Twinbrook Metro station), I’m still delighted that it’s here and we’re part of a larger regional network. Capital Bikeshare puts over 1800+ bicycles at 200+ stations across Washington, D.C., Arlington and Alexandria, VA and Montgomery County, MD. Check out a bike for your trip to work, Metro, run errands, go shopping, or visit friends and family and return it to any station near your destination. Join Capital Bikeshare for a day, 3 days, a month, a year or try their new daily key option, and have access to their fleet of bikes 24 hours a day, 365 days a year. The first 30 minutes of each trip are free. Each additional 30 minutes incurs an additional fee of $1.50 to 2.00, depending on your membership level. Capital Bikeshare station in Washington, DC. The City of Rockville has announced that Capital Bikeshare is coming to Rockville in early fall with 13 bike stations through a partnership with Montgomery County. Capital Bikeshare is a network of bicycle-sharing stations that provides access to bikes and offers an alternative to driving. Check out a bike for your trip to work, run errands, go shopping, explore a neighborhood, head to a park, or visit friends and family. Through bikesharing, cyclists can rent a bike from a designated station and drop it off at any other station within the Capital Bikeshare network. The program currently has more than 1,800 bikes at over 200 stations in circulation across Washington, D.C. and Virginia. It’s been incredibly popular in Washington, DC with both residents and tourists, and I’m happy to see it come into Rockville. 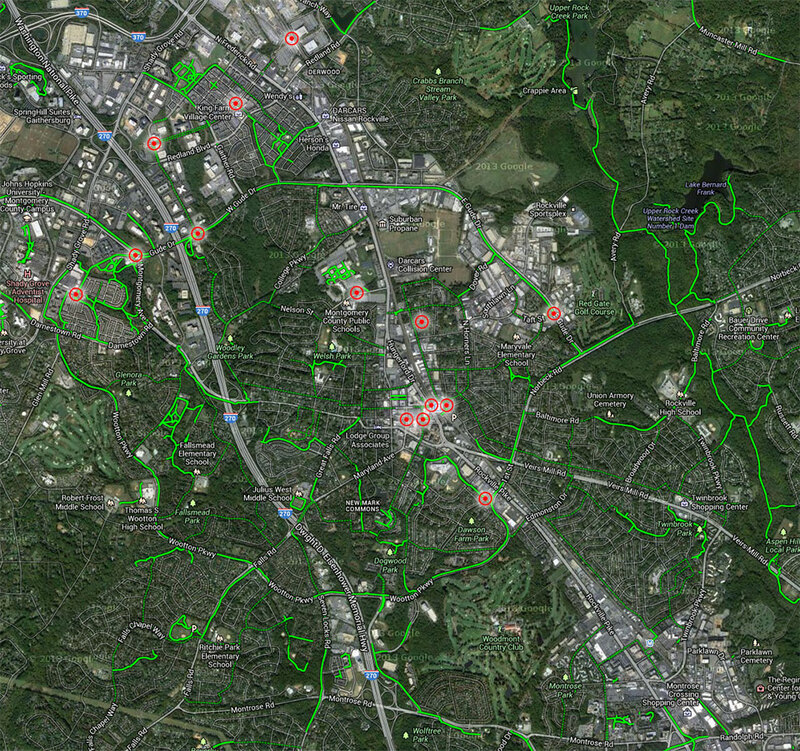 Proposed stations for Capital Bikeshare on a Google Map with bike routes. Click to enlarge.